Fortun’s Finishing Touch Sauces and Ultimate Gourmet Soups were developed by a man who knows a thing or two about quality foods. In 1981 Kevin G. Fortun developed Stockpot Soups, a line of premium, fresh-refrigerated soups. His goal was to provide quality, convenience and consistency to food-service operators with a product made from the freshest, all-natural ingredients. The end result was a fresh, homemade soup with no MSGs, no preservatives and no artificial ingredients. Stockpot Soups quickly became the leader in the field. After expanding into the retail market, it grew into the largest fresh-refrigerated soup company in the world, selling in 23 countries. Stockpot sold to Campbell’s Soup Company in 1998. Kevin Fortun is a proven trend-setter in the food business. Known for developing Stockpot Soups, he consulted with top chefs to come up with innovative sauces and soups that started the trend of fresh first. 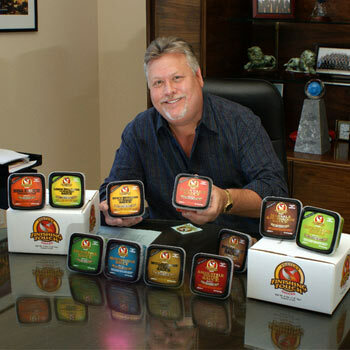 His newest creation, Fortun’s Finishing Touch Sauces and Ultimate Gourmet Soups, has created buzz in both retail and food service, continuing to position him as a top leader in the industry. Fortun has the golden touch once again. His company has the experience, knowledge and fortitude to change the way you look at sauces and soups. You can trust Fortun Foods, Inc. to produce the finest refrigerated fresh soups and sauces commercially available. You can also count on them to establish relationships with employees, customers and vendors based upon honesty, trust and the highest ethical standards of fair treatment. To ensure that each recipe starts with the best, the proprietary chicken, veal or beef stock is roasted right from the bone to become restaurant-quality bases. Rich, authentic, natural ingredients and spices are added at just the right time to complete the chef-inspired finishing touch for these soups and sauces crafted in small batches.